Yay for snacks! They can satisfy cravings, help you watch your weight, boost your metabolism, and even help you deal with sadness. Whatever your mood, there is a snack for you. So, let’s take advantage of National Snack Month in February. Hoard your favorite snacks and munch away. Snacking doesn’t always have to be unhealthy. In fact, it can be a great way to eat more proteins, fiber, and fruits — thereby helping your body stay in shape. Happy snacking! A study showed that children in the U.S. snacked six times per day. That was twice as often as American children in the 1970s. Hershey's invented M&M's so that it could send some heat-resistant chocolates to soldiers in World War II. When Ruth Graves, a restaurant owner in Massachusetts, added pieces of chocolates to her cookie mix, hoping they would melt, little did she know that her failed experiment would produce the world's most- loved cookie! The Wunderlee Candy Company produced candy corn . It is interesting to remember that in those days candies were made by hand. Evidence of wild date seeds, pine nuts, walnuts, acorns, and chestnuts can be found in the Shanidar Cave located in Northern Iraq. Cave dwellers loved to snack too! Some health experts believe that healthy snacking several times a day maintains a good BMI and prevents blood sugar levels from spiking. Don't you just love research? Giving in to your cravings once in a while is okay. That's why diet plans have cheat days. So, have fun. You're allowed to — at least this month. There is something satisfying about making your own snacks. The fact that it will be fresh and preservative-free is a bonus. Every Oreo cookie is 71% wafer and 29% crème filling. Each one! In every batch! Frito Lay uses a $40,000 chewing simulation device to test the crunchiness of their chips. You'll never find out the recipe for Krispy Kreme's world famous glazed donuts because it's kept under lock and key at their plant in Winston-Salem, NC. Salt is addictive and snack food companies know that. They add it in a way that gets consumers hooked on their snacks. He sprinkled chili powder on the original. The world got a spicy snack and he was made VP! Yes, we all snack. While some of us pick healthy foods, many of us are guilty of indulging. But this month — who's judging? Snacks come in all shapes, sizes, and flavors. 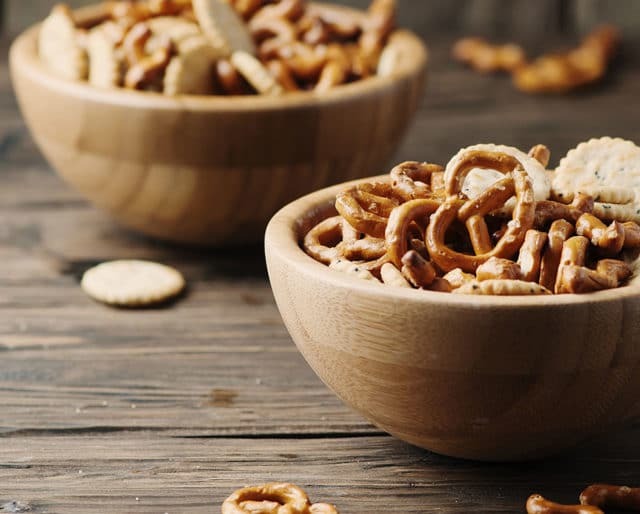 Snacks can be healthy or your guilty pleasure. You just need to take your pick. Choose fruit, an energy bar, or low fat yogurt as your in-between meal and your body will thank you.